In the To The Last Smoke series Stephen J. Pyne describes the nation’s fire scene region by region. 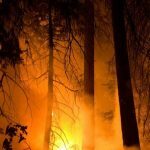 Today we offer an excerpt from California: A Fire Survey. Pyne is a historian in the School of Life Sciences at Arizona State University. 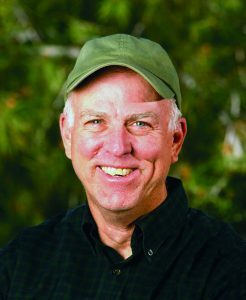 He is the author of many successful books, mostly on wildland fire and its history, but also dealing with the history of places and exploration. California burns, and frequently conﬂagrates. The coastal sage and shrublands burn. The mountain-encrusting chaparral burns. The montane woodlands burn. The conifer-clad Sierra Nevada burns. The patchy forests of isolated Sierra basins; the oak savannas, on hillsides turning golden in summer; the seasonal wetlands and tules; the rain-shadowed deserts, after watering by El Niño cloudbursts; the thick forests of the rumpled Coast Range; the steppe grasslands of the Modoc lava ﬁelds; sequoia, exotic brome, chamise, sugar pine—all burn according to local rhythms of wetting and drying. The roll call of combustible plants and places goes on and on. An estimated 54 percent of California ecosystems are ﬁre dependent, and most of the rest are ﬁre adapted. Only the most parched of Mojave deserts, stony summits, perennial wetlands, and fog-sodden patches of the coast are spared. Not only do ﬁres burn everywhere, but they can persist for weeks and can, from time to time, erupt into massive busts or savage outbursts. Fires can burn something every year. Fire season, so the saying goes, lasts 13 months. Like earthquakes, California experiences a constant background of tremors occasionally broken by a Big One. This is not news. Anyone even casually familiar with California knows it burns, whether those ﬁres be conﬂagrating chamise or gas-combusting autos. In fact, most of the United States burns, or can burn, or has burned historically, and virtually every California ﬁre regime resembles those nearby. The northern Coast Ranges and Cascades burn like those in Oregon. The Central Valley is a larger, drier version of the Willamette. The Sierra Nevada looms like a gargantuan Sky Island, the lithic anchor for the Basin Range. The Mojave Desert laps into the Great Basin and Sonoran Deserts. California’s shrublands are Arizona’s on steroids. Each biota, in brief, has an echo elsewhere. Northern California has lightning ﬁre busts; so do the Cascades. Southern California has extensive burns; so does central Nevada. California slams disparate regimes together; so do most west-ern states. Eastern and western Washington, or northern and southern Idaho, have as little in common as the California’s postmodern pastiche. 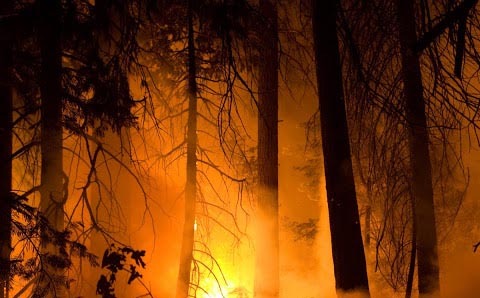 Rather, what makes California’s ﬁre scene distinctive is how its dramatically distinctive biomes have been yoked to a common system and how its ﬁres burn with a character and on a scale commensurate with the state’s size and political power. California has not only a ferocity of ﬂame but a cultural intensity that few places can match. In the early years Northern California commanded the scene; after World War II, South-ern California; but the state as a whole has a concentrated ﬁrepower without parallel elsewhere. Northern California beat back the challenge from light-burning by devising systematic ﬁre protection: Southern California dampened the movement to restore ﬁre by pushing ﬁre management into an urban ﬁre-service model. In the pyrogeography of America, California is the great disturbance in the Force. In ways unmatched by any other region it has projected its presence—its ﬁres and ﬁre practices—throughout the country. The reasons inv olve more than bigness alone. In some years Alaska has immense ﬁres, some the size of northeastern states, yet they do not upend national policies. Texas holds more land, and in recent years has been overrun by ﬁres larger in area than those that sweep California, yet those ﬂames have not bonded with a national agenda. New York has a similarly split geography between concentrated metropolis and rural countryside, with the “forever wild” Adirondacks as a wilderness backdrop, yet it remains invisible on the national ﬁre scene. By contrast, California’s ﬁres are instantly and hugely broadcast, they infect national institutions, they have repeatedly deﬁned the discourse of ﬁre’s history. No other state has so shaped the American way of ﬁre. Along with Texas and Alaska, it has long behaved as a state-nation. The issue is more than size: Nevada is large, but until recently it grew as an appendage to California; its ﬁre busts pass through the national consciousness with no more eﬀect than wind gusts over a salt playa. The state-nations, by contrast, have unusual political histories, land owner-ship patterns, and creation stories that make them exceptional. Texas was a latent nation for nearly 10 years, although eﬀectively a protectorate of the United States; and when it entered the union, it did not surrender its unpatented lands. A large place with a small population, it never developed adequate institutions, relied on “big men” (large landowners or cattle or oil barons) to run society, and evolved a lively folk culture. Alaska was a territory for 90 years, geographically and politically isolated from the rest of the country, and when it was admitted, it was able to negotiate a division of lands and retain many federal subsidies not available elsewhere. Like Texas a high culture never took root and it had a distinctive origins myth. Unsurprisingly, both voice secessionist tendencies during times of stress. Texas tends to view the United States as France does the European Union, as a means to amplify and project Texas values. Alaska sees the United States as a source of economic subsidy, often behaving more like a country bonded under a commonwealth than like one of the 50 states. California shares their size, political isolation, and sense of separate selfhood. It began—almost—as a separate country during the Bear Flag republic; by agreeing to accept existing Mexican land grants with the Treaty of Guadalupe Hidalgo, it carved out the choicest lands and created a pattern of large landowners; with the gold rush it has an origins myth founded on a peculiar dynamic of untrammeled individualism and in its early moments of unfettered exploitation. Unlike Alaska it has a fully functioning economy, although one sharply subsidized. Unlike Texas it has never confused size with signiﬁcance. It has been independent but never secessionist. Unlike Texas, too, it has a bond to high culture; from its onset it has attracted an urban and intellectual society, rich in literature, painting, and later ﬁlm, which it has reshaped and broadcast back across the country. And unlike Texas it has not exploited the national scene to magnify California sensibilities, but has seen itself as coalescing and shaping a national story, and even an international one. California’s is, paradoxically, a cosmopolitan parochialism. All this is reﬂected in the character of its ﬁres. California is, in Wallace Stegner’s oft-repeated remark, like the rest of America only more so. Today, nearly one in nine Americans lives in California; the California economy is the eighth largest in the world; and depending on perspective California either anchors or weighs down national trends. The California ﬁre scene boasts commensurate dimensions. Southern California holds one of the three dominant wildland ﬁre cultures in the United States; it commands 50 percent of the national ﬁre budget, and an inordinate fraction of the nation’s fuels management funds; it claims most ﬁreline fatalities, 35 percent; it has one of two national ﬁre research labs and one of two ﬁre equipment development facilities. Of the 11 coordination centers that make up the national ﬁre dispatching system, two lie wholly within California. That profound distortion is also historical: California was where the debate between ﬁre ﬁghting and ﬁre lighting as alternative national policies was fought out, where systematic ﬁre planning was ﬁrst devised, where presuppression schemes achieved their most grandiloquent expression, where air attack and the interregional hotshot crew emerged, and where the modern organizational structure for ﬁre—the incident command system—was hammered out before going national, and then global. The California model proved portable in ways the Florida model or the Great Plains model never did. California is indeed like the rest of the country only more so. Stephen J. Pyne is a historian in the School of Life Sciences at Arizona State University. He is the author of more than twenty-five books, including The Ice: A Journey to Antarctica, How the Canyon Became Grand: A Short History, and Voyager: Exploration, Space, and the Third Great Age of Discovery. He is also the author of Between Two Fires: A Fire History of Contemporary America, published by the University of Arizona Press.